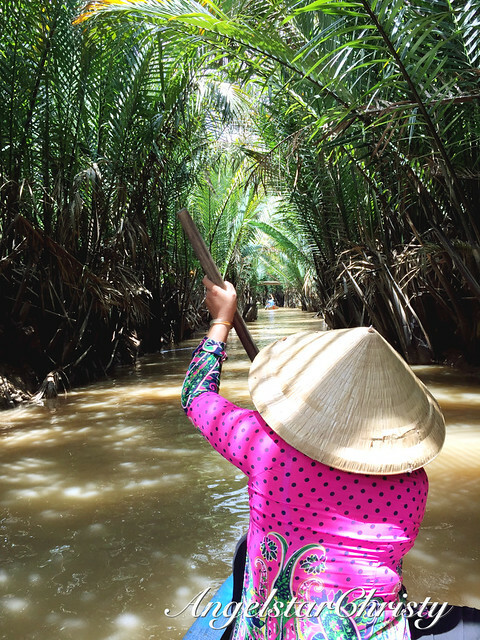 Life on Mekong Delta is mostly centered on both agriculture and aquaculture. 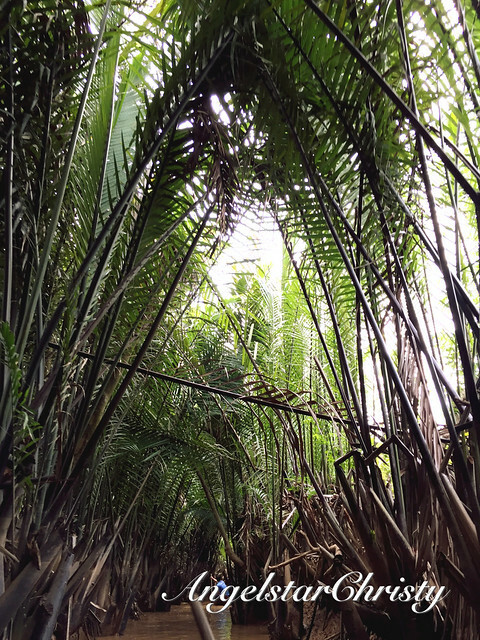 While that translates to the rice paddy fields, the tropical fruit orchards on land, the watery passages are what make up the core of the landscape in this region and are not any less in sharing the highlight in their role. 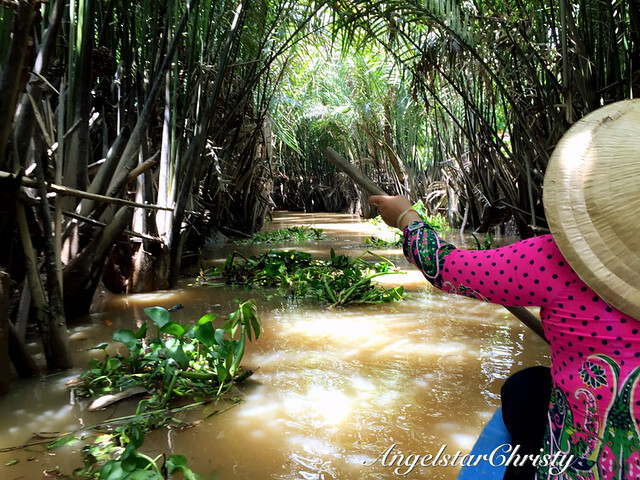 The Mekong Delta was depicted in all its might and extensive width as we took the boat ride to take in its wonders. However, the real gem is what is being concealed from the broad daylight view from the main river passage and takes place right behind the trees. 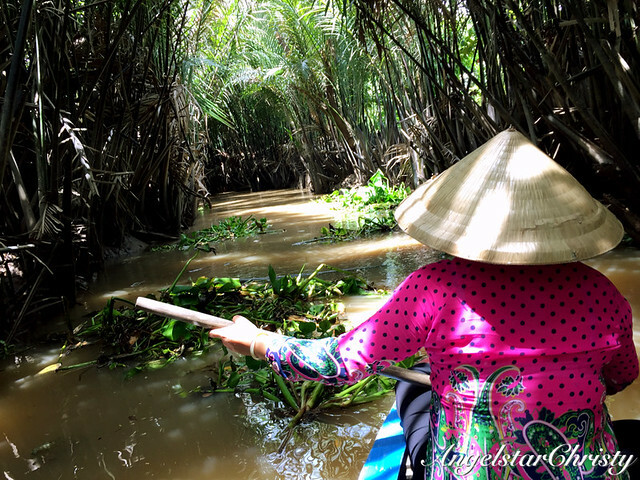 It is what defines the Mekong Delta in the first place, anyway. 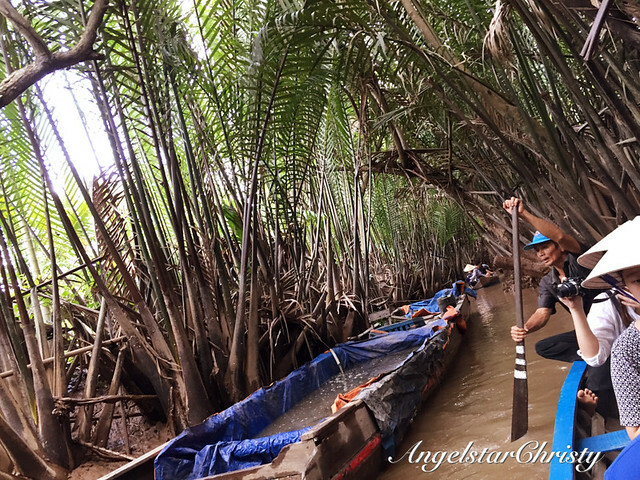 It is truly a journey to a hidden dimension of the Mekong Delta to uncover the secrets of the nature and the fruits of the earth. 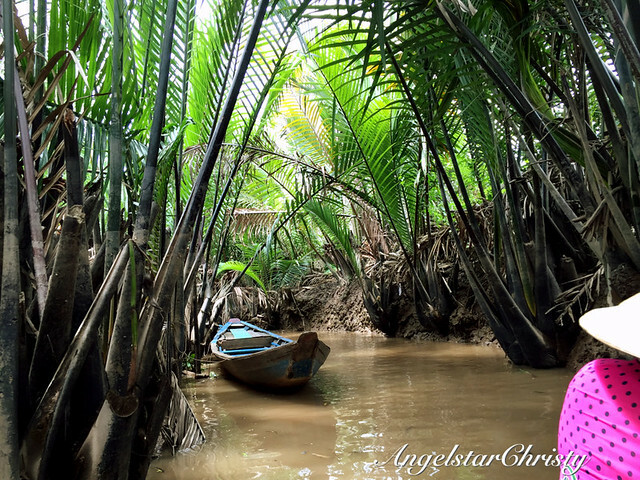 We got off the earlier boat which docked at a small manmade wooden pier jutting out on the other side of the riverbank and made our way through sparingly distanced coconut palms among the mangrove trees before that first glimpse of the next part of the journey comes into view. 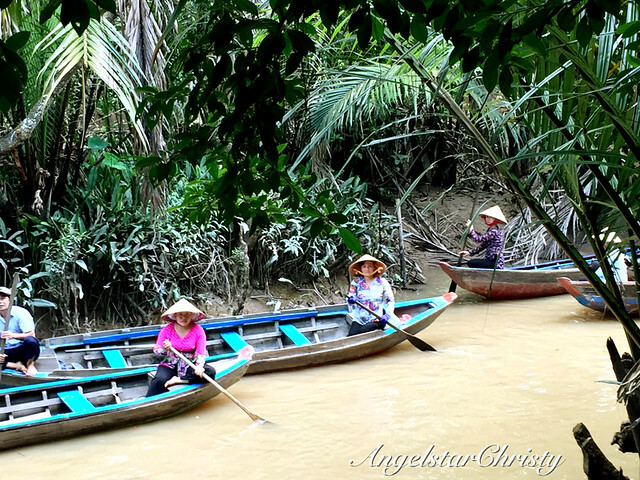 The long and shallow wooden boats, or sampans float on the shoal. What appeared to be a few was then joined by a few others; forming that tiny colony of boats manned by the men and women wearing caps and the unmistakable signature conical hats while holding a paddle each in their hand. These were the boats which are going to take us on the next part of our adjourning journey, along this narrow waterway. 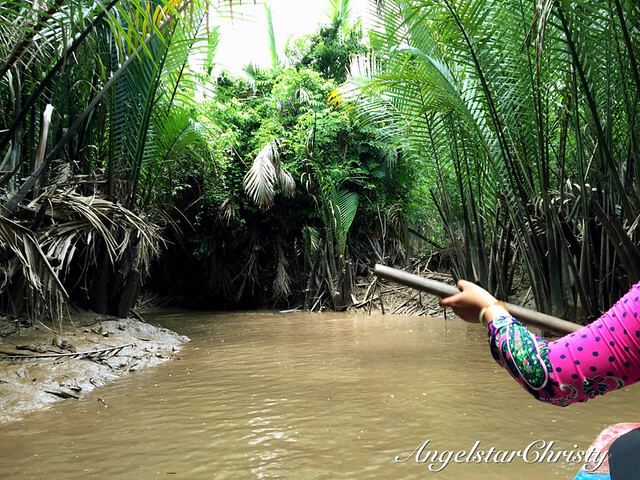 It was a far cry from the earlier width of the river as this is just a stream; or that waterway passage that runs behind the trees lining the banks and in parallel with the main river passage of the Mekong. 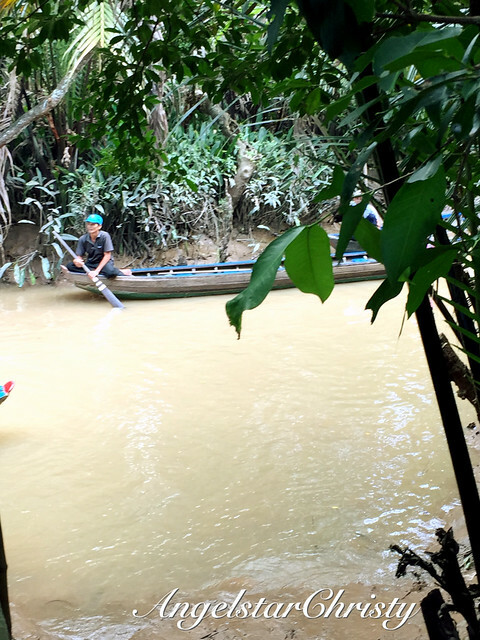 Each boat limits to only four passengers and are wobbly due to its shallow height and each of us had to maintain the balance as we tread onto the thin platform which separates the floor of the boat from the water below. 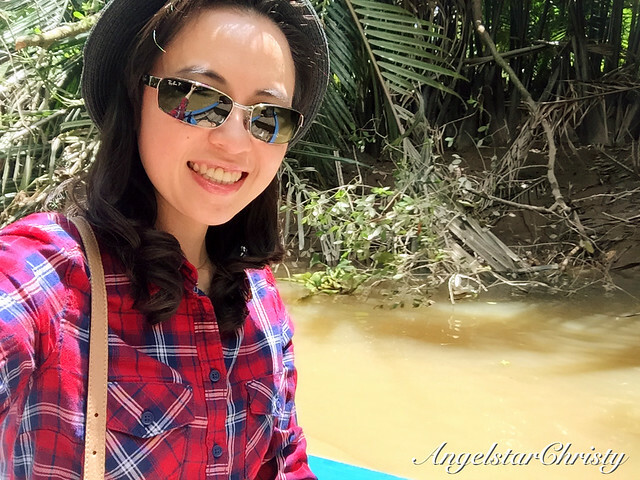 Once we were settled in the boat, the boat would set off as it is paddled by the person seated at the front of the boat; in which case we had a kind elderly woman who paddled the stick into the water in a rhythmic and continuous manner to push the boat forward. Cruising along the murky waters flanked by muddy banks gripped by the visibly flimsy roots of the huge trees above while our boat rocked and swayed a little as we avoided the occasional obstructing fallen pal branch, pushed aside, was more than just a minuscule version of the earlier journey. 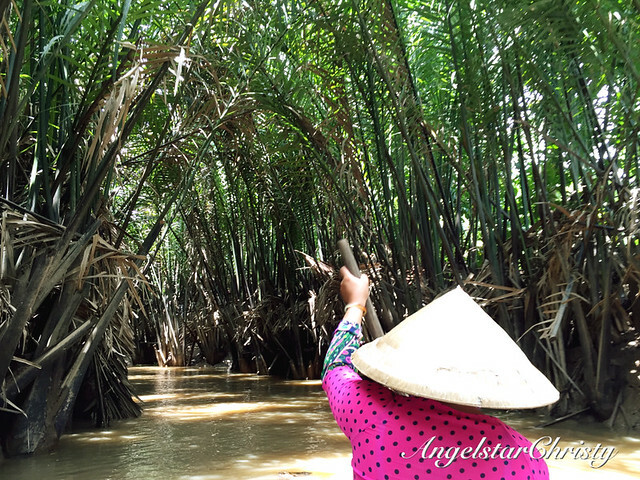 The branches of the trees of both sides of the banks were touching each other in that endearing manner and formed archways; one after another as we cruised along the small waterway was truly a magical sight. 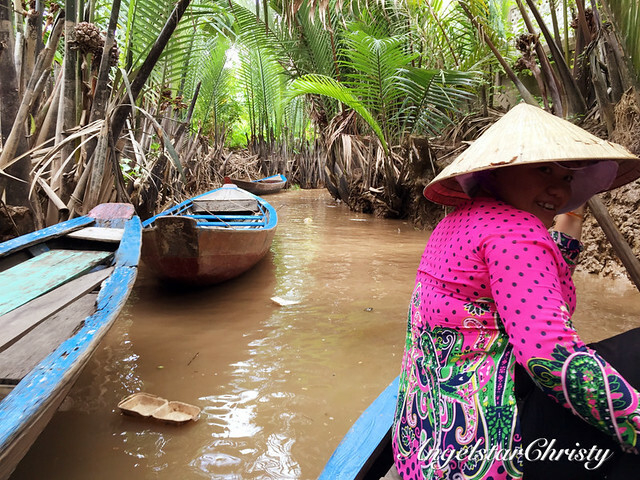 This elderly lady manning our boat, or Baa (Vietnamese for older female) dominate the scenes captured but it was duly her credit as she navigated her way through this familiar water route while keeping us safe and balanced in the boat. 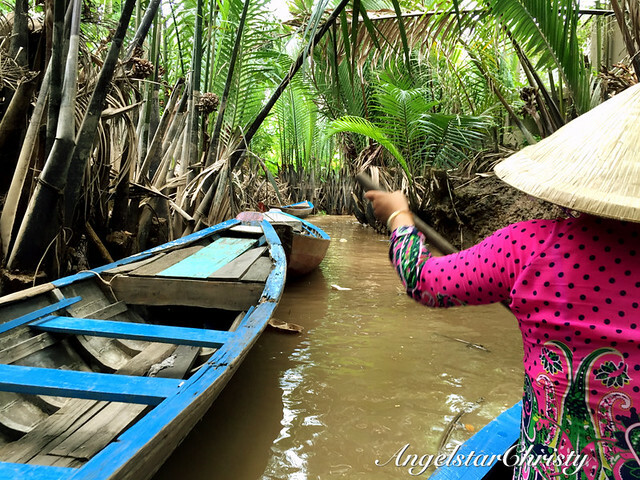 She avoided most of the obstacles, which came in forms of the fallen palm branches, trees or even huge clumps of greens which were known as their water cabbages, found on the Mekong Delta, to maintain the balance of the boat as we cruised smoothly along the water. 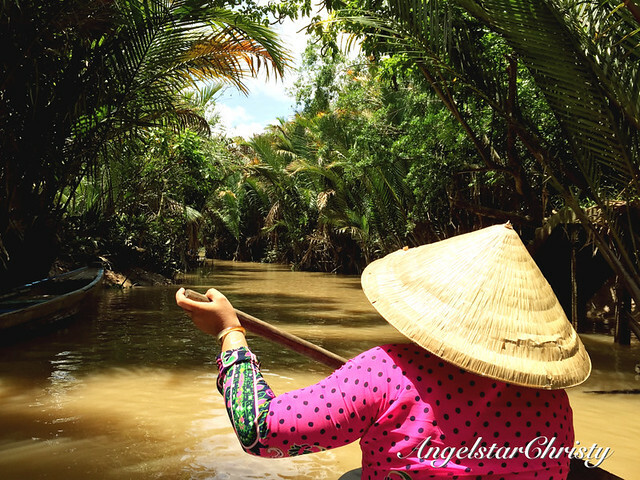 It was a beautiful sight and it was perfect with her comical hat, her colorful attire and just that elevated hand to show her paddling in action. 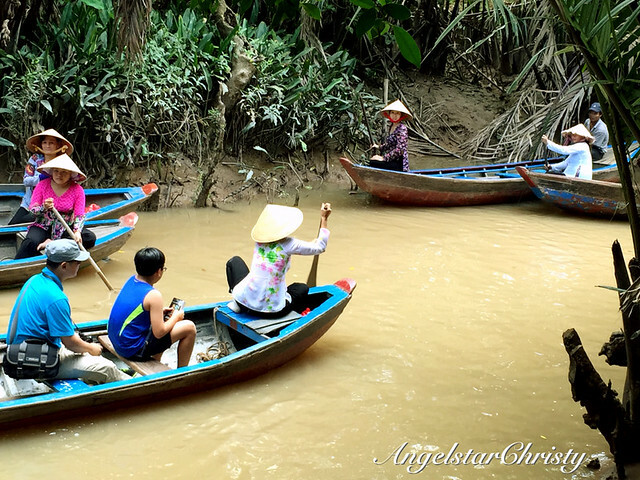 There were times when the paddling was not even needed as the currents of the water, though naturally slow, helped to push the boat forward in a gentle fashion. Perhaps it was the continuous stream of boats along the narrow passage which stirred that mild current, but it is as though our Baa just decided to go with the flow and just let the forces of nature take over. I love how poised she looked as she sat and observed in silence while letting the water push us forward and the sounds from the crickets serenading the atmosphere in the natural surroundings. 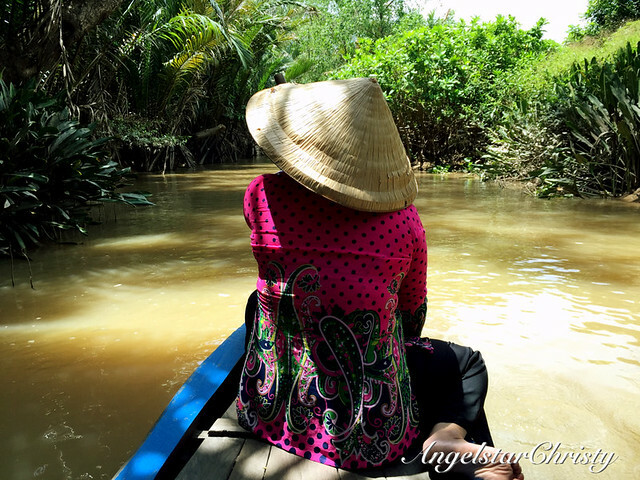 Not forgetting the Ohng (Vietnamese for elderly man) who was the pillion paddler at the back of the boat, who helped Baa in maintaining the balance of the entire boat. 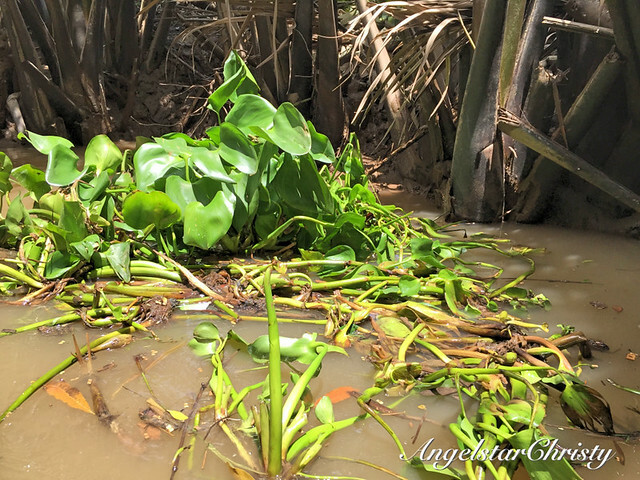 This is how it is like on the bank and it is a beautiful experience, not to mention an eye-opening and memorable one too. If this is what goes behind the trees standing in close cluster in their bid to guard against the modernization which flows through the massive water on the main river, I am glad I have been let into the secret. This is a secret I cannot keep. It is one that I will remember forever; as the sounds of the wooden paddle contacts the water accompanied by the cricket sounds, crackles of the leaves continue to ring in my ears and my eyes take in the simple yet humbling sights of the trees bent as they touch each other as though lovers rubbing their foreheads together. 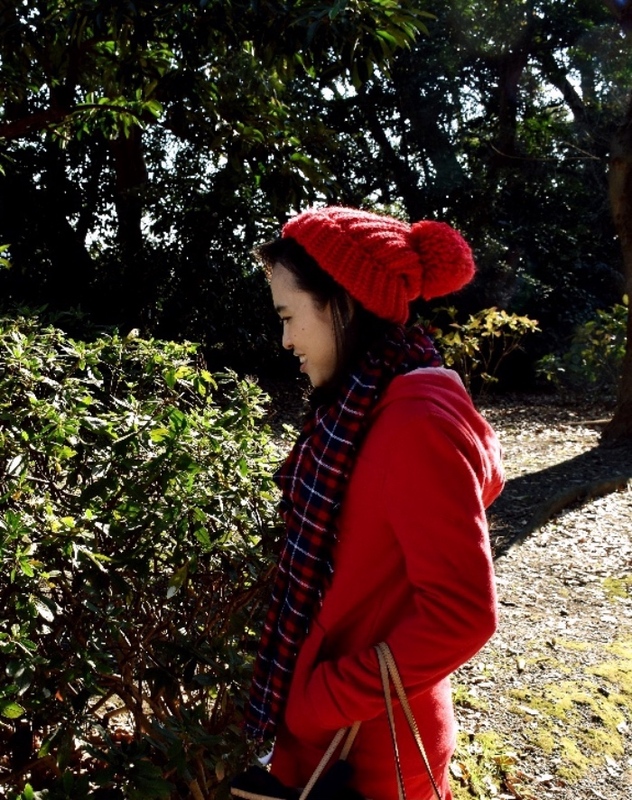 This is the secret of the trees and nature. I am glad they allowed me in to take in the journey through their secrets as they shyly make way while we silently pass through each and every one of them. The trees may blush, but we are struck with awe at the wonders of nature. Do put on mosquito/insect repellent or cover your arms and legs as there are lots of mosquitoes and insects. This is a river and swampland after all. Photos all belong to me and are copyrighted.